We have been tracking our net worth for almost 2 years now (19 months to be exact). In that time, we have seen several of our asset classes grow, while our liabilities have dropped. That is what we have been doing since first reporting our net worth numbers back in March 2015. In that time, we have seen our net worth grow by almost $84,000! Who knows, by the time this March rolls around … maybe we will be up $100K! Before we move on to reviewing our latest net worth numbers, I wanted to point out that we are using our Personal Capital account to do most of the work. We are tracking our net worth through this free account. This tool has made it possible for us to easily track our net worth at a moments notice. 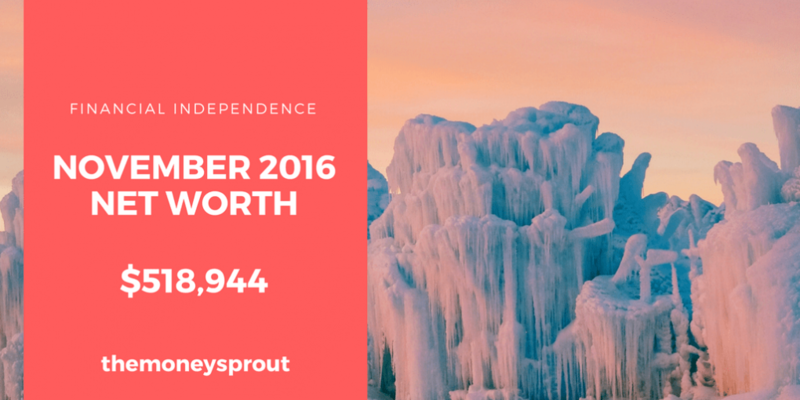 As of November 23rd, 2016 – our net worth is $518,944.32! So here is our most recent update, compared to our last net worth post back in September. Our net worth in November 2016 rose by 1.2% compared to September (2016). That is an increase of ~$6,300 over the past 2 months. From September to November – we have been trying to invest more money into the market. Unfortunately we hit a lull back in the summer with new investments. That has hurt our net worth growth, so we are really trying to pick up the slack. These gains in our investments are from a combination of new money going into the market, along with capital gain increases. The value of our investments rose by .6%. We saw a slight decline (-5%) in our cash since last reporting. This is really nothing more than the timing of when these net worth reports are posted. Overall, we want our money to be put to work earning more income for us. So we are never going to grow our cash balance much higher than where it is now. Despite the limitations of reporting our home value, it is neat to compare our home value estimate against our outstanding mortgage balance (approx. $184,000). Total assets rose by almost .4% since last reporting. Every month we continue to pay down the balance on our auto loan. Based on when I last reported, we have only made one car payment. Otherwise, our loan would have dropped another $300+. Our credit card balances fluctuate a lot month to month. One of our goals since we last reported net worth was to work on lowering our credit card balance. Since last reporting, both our mortgage and car loan balances dropped – as expected … along with our credit card balances. I never like to see our liabilities increase. An increase in over $3,500+ is what I like to see! Remember that there are 2 sides to the net worth equation. Increasing your assets while lowering your liabilities. Eliminating debt is just as important as building your assets when it comes to growing your net worth. After reviewing our net worth number for this November, there are two positive pieces of data that I see. First is that for the first time ever, we have pushed our total liabilities under $200K. It may not seem like a big deal, but it is certainly a milestone … and I like hitting milestones. Second, and more important is that we had another first for our net worth. Our liability increases ($3,506.09) were higher than our asset increases ($2,809.44). Of course, I would have loved for our assets (especially investments) to jump through the roof. That didn’t happen but our lowering liabilities picked up the slack. I think that is a perfect example of just how important lowering your debts can be when it comes to building net worth.